James was first married to Sarah Ann Haw, she passed away in 1909. On the 8th May 1919 James married Mabel Hill at St Pauls Church, Liverpool, England. He remained an orchardist living at “Fairview”, Officer. 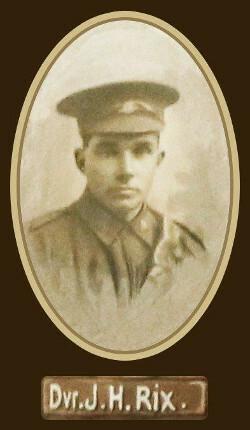 Returned to Australia on the 2ndJune 1919. Discharged on the 4thSeptember 1919. “Rix – On the 23rd March at Prince Henry’s Hospital, James Henry the dearly beloved eldest son of Henry John and the late Jane Elizabeth and loving brother of Bert, Lil, Pic and May. A patient sufferer at rest. Died on the 23rd March 1938 at Melbourne, Victoria. Buried on the 24th March 1938 at Berwick Cemetery.